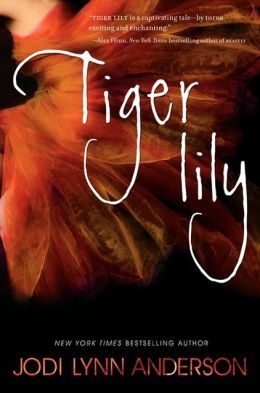 Tiger Lily by Jodi Lynn Anderson is a bittersweet tale of adolescence; beautifully but painfully capturing the missed connections, the longing, and the growth that frames this defining period of life. Narrated by Tinker Bell, and populated with twists on the classic characters, pervasive quality of magic, and darkness that is Neverland, Anderson leads the reader on a surprisingly personal tale through a world that many of us lay claim to. As a young girl who was obsessed with Peter Pan (my sister and I, would even coordinate our pajamas and lay out shoes at the ends of our beds at night, just in case he flew to our window), I was hooked in to Tiger Lily’s perspective, eager to read about the legend himself from his most infamously spurned love interest. I was initially struck with the poetic language that Anderson wrote this story with, I suppose I was expecting a fluffier approach, a sort of fast and loose, teen romance. What I got was a sophisticated narrative that imbued new stock in to this well known fairy tale. Tiger Lily was adopted in to her tribe by the shaman, Tik Tok, a sensitive man who likes to wear elaborate hairstyles and women’s dresses, born to be two genders. He is an individual and encourages Tiger Lily to be herself: quiet, strong, a wild hunter. Unfortunately, Tik Tok can’t stop the other village elders from deciding it is time for his adopted daughter to marry a brute of a man. As a result, she begins to spend more time in the woods where she is drawn in to Peter’s world. I was impressed by the adult themes that Anderson wove in to her retelling, including alcoholism, sexual abuse, the burden of silence, gender, identity, and even suicide. They lent a realism to this fantasy world that made it less foreign and more tangible. I also found the author’s depiction of Peter as spot-on, and probably what made him so enthralling to me all those years ago. His zest for life, and unfaltering confidence made him irresistible, but beneath this demeanor was simply another young man terrified of responsibility, threatened by the strength of a young woman who could have been his equal. If only I’d read Anderson’s version of Peter Pan before I learned the truth about this type of unattainable boy firsthand, I could have saved myself a lot of heartbreak!